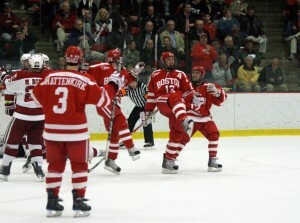 The Boston University men’s hockey team plays its first of two regular-season games at marquee venues when it faces No. 7/8 Cornell University at Madison Square Garden on Saturday night (8 p.m.) in the return of Red Hot Hockey. Two years ago, the Terriers defeated the Big Red, 6-3, in front of a sellout crowd of 18,200 in the first Red Hot Hockey. The showcase is certainly bigger than most regular-season games in the minds of fans, but is it bigger in the minds of the coaches and players? “Absolutely,” BU coach Jack Parker said. “Because of the renewal of the rivalry, because of the venue. It gets everybody jacked up. The Terriers (4-7-1) have not played well for much of this season, but on Tuesday night, they put forth one of their best efforts of the year when they defeated Harvard University 6-5 in overtime at the Bright Hockey Center. One of the keys to that victory was a change in attitude following a lackluster practice on Monday that ended with Parker heatedly scolding his team for its poor work ethic. According to junior forward Joe Pereira and sophomore forward Chris Connolly, the team held a players-only meeting to discuss the issue, and came out of it with a better sense of responsibility and more determination to play for each other. Parker said that attitude has continued in practice this week. Beating the Big Red (6-2-0), however, could prove to be a much more difficult task than beating the Crimson (1-5-2). Cornell is fueled by its explosive offense and lethal power play. The Big Red’s 4.12 goals per game are good for third in the nation, while their 31-percent conversion rate on the power play places them second. Senior forwards Blake Gallagher (8 goals-6 assists-14 points) and Colin Greening (4-9-13) lead the way offensively. Their 1.75 and 1.63 points-per-game averages rank second and sixth in the country, respectively. Junior forwards Joe Devin (4-6-10) and Riley Nash (2-7-9) are both averaging more than a point a game as well. Opposing that offense in the Terrier net will be sophomore goalie Grant Rollheiser, who is 1-0-1 this season and 3-0-2 in his last five starts. Rollheiser has never started a game of this magnitude in a venue this big, though. Parker, however, doesn’t seem too worried about how his backstop will perform, saying he “hadn’t thought about it” until asked. Parker expressed a little more concern when asked how he thought his freshmen would perform. Game notes: The BU-Cornell rivalry dates back to 1925, and reached its peak from 1965-1984 when both schools were members of the ECAC. The Big Red lead the all-time series, 23-17-1. The teams have met in two national championships, with Cornell winning in 1967 and BU winning in 1972. … The Terriers are 6-2-1 all-time in Madison Square Garden. Prior to the first Red Hot Hockey, all but one of BU’s appearances there were in the ECAC Holiday Festival from 1961-1977. … Colby Cohen missed Friday’s practice because he had to go home to get a shot in the hip he had surgery on over the summer, but he is expected to play, according to Parker. … The flu, which has struck Bonino and freshman forwards Alex Chiasson and Wade Megan in the last week, is still running through the team, but shouldn’t keep anyone out barring a setback. “Everybody’s hacking and coughing, but everybody’s in the lineup,” Parker said. … Pereira will remain on the top line with Bonino and Connolly despite Chiasson’s return to the lineup. “He deserves that,” Parker said. Chiasson will play on the third line. Hard work. Grit. Determination. These things don’t show up in box scores. They don’t need to. It doesn’t take a hockey expert to know when they’re present and when they’re not. For most of the Boston University men’s hockey team’s 2009-10 season, these intangibles haven’t been there. In Tuesday night’s 6-5 overtime victory at Harvard University, however, the Terriers put these characteristics on full display for all 3,076 Bright Hockey Center patrons to witness. For almost all of the game’s 62-plus minutes, the Terriers battled along the boards to move pucks, grinded in the corners to keep plays alive and won races to loose pucks to create chances. It was this constant perseverance that enabled BU to come from behind four different times to tie the game, culminating in senior forward Zach Cohen’s overtime-forcing goal with just 19.5 seconds left in regulation. The Terriers displayed a conviction to win and an unwillingness to lose that fans, media and coaches had yet to see from this year’s squad. That lack of drive and desire that had previously plagued the team was perhaps never more evident than during a lackluster practice on Monday that ended with BU coach Jack Parker lashing out at his players with a level of fire and intensity he rarely reaches nowadays. “Yesterday, we had a tough practice,” sophomore forward Chris Connolly, who netted the game-winning goal, said. “We weren’t very focused. We weren’t very sharp. And we knew that. It was do or die coming into tonight. We needed to change our attitude, or something bad was going to happen. So, we decided to buckle down and come in with the right mentality tonight. Every BU player seemed to embrace this new mentality on Tuesday night, but three Terriers in particular really stood out –– senior forward Zach Cohen, junior forward Joe Pereira and sophomore forward Vinny Saponari. Cohen (2 goals) and Saponari (2 assists), wingers on the Corey Trivino-centered second line, consistently won 1-on-1 battles by using their big frames and physicality to fend off Harvard defenders. Cohen scored both of his goals by parking himself in front of the Crimson net and refusing to budge. 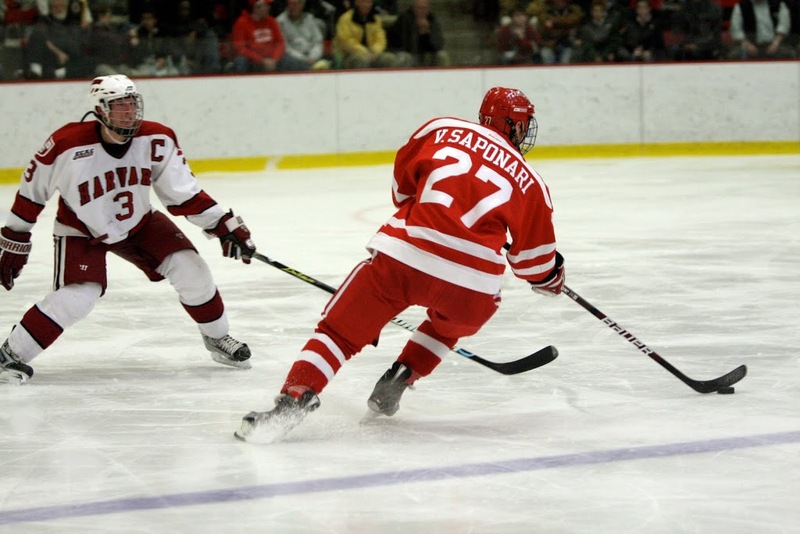 Saponari’s two assists came from him outworking the opposition down low and moving the puck back to the point. Saponari also made the lunch-pail play of the game in the third period when he single-handedly kept the puck in the offensive zone while four other Terriers changed off, ultimately leading to a scoring chance for sophomore forward Ross Gaudet. Pereira, whose 5-foot-10 stature doesn’t quite match up to that of Cohen or Saponari, made his impact with speed and hustle. “Bulldog” tallied a career-high two goals (both on the power play) and four points in his return to the top line. Both of his goals were the result of him getting to rebounds quicker than any Harvard defender. One of his assists was the direct result of a valiant wraparound attempt that left a juicy rebound for junior forward Nick Bonino to deposit. The Boston University men’s hockey team fell behind 2-1, 3-2, 4-3 and 5-4 on Tuesday night, but senior forward Zach Cohen’s goal with 19.5 seconds remaining in regulation tied the score at five, and sophomore forward Chris Connolly provided the heroics with the game-winning goal in overtime, giving BU a thrilling 6-5 victory over Harvard University at Bright Hockey Center. In the first period, a tripping penalty was called on Harvard’s Louis Leblanc at the 2:19 mark, and 94 seconds later, the Terriers (4-7-1) took the early 1-0 lead on junior forward Joe Pereira’s power-play goal at 3:53 in the first stanza. It was the West Haven, Conn. native’s second goal of the season, and his first since he scored BU’s third goal in its 3-2 win over the University of Michigan back on Oct. 24. The Crimson (1-5-2) responded six minutes later on freshman forward Conor Morrison’s first of four goals on the night. BU freshman Max Nicastro tried to clear the puck from behind the team’s own net, but it went off the referee’s skate, and to Harvard’s luck, it landed right in the slot where Morrison put it away, tying the score at one. Harvard took its first lead of the game at 13:09 in the first period. BU turned the puck over in its own defensive end, and the puck popped right up to sophomore forward Alex Killorn, who swatted it in mid-air towards the net, where sophomore goaltender Kieran Millan (21 saves) completely misplayed the puck, letting it go off his blocker and into the net, giving the Crimson a 2-1 lead. With 3:28 remaining in the first period, Zach Cohen tied the game at two apiece with his fourth goal of the season, assisted on the power play by sophomore forward Vinny Saponari and sophomore defenseman David Warsofsky. Morrison scored his second goal early in the second period, but at the six-minute mark a Harvard player was called for holding, and Pereira (2 goals, 1 assist) netted his team’s third power-play goal of the night and his second of the game 34 seconds later, tying the game 3-3. “He’s been playing really, really well,” Parker said of Pereira’s play. “He gives that line so much energy, gives [junior Nick] Bonino so much energy. And the fact that Bonino had him on his right wing and he also had Connolly back on his left wing gave him some more people to make some plays with. The two teams traded goals in the third period, with Harvard taking 4-3 and 5-4 leads only to have BU come back and equalize the score both times, with Cohen’s goal at the 19:41 mark being the most dramatic and sending the game to overtime. With 2:18 remaining in overtime, Connolly ripped BU’s 49th shot of the game past Harvard netminder Kyle Richter (43 saves), sealing the Terriers’ 6-5 come-from-behind win. “It shows a lot of character to be able to come back and to never get down and be resilient enough to get that win in overtime,” Connolly said. Hey guys, bad news. Just heard from Scott, and the internet situation at Harvard is a definite no-go. Check back later tonight for postgame coverage, and check in later this week for coverage leading up to, during and after Saturday’s showdown at MSG against Cornell. Forward Sahir Gill of the United States Hockey League’s Chicago Steel has committed to Boston University for the 2010-11 season, according to The Real Okanagan Hockey Academy Blog. Gill, a 5-foot-10, 180-pound left-handed shot, currently ranks seventh in the USHL in scoring with six goals and 14 assists through 16 games. In 2008-09, the Terrace, British Columbia native recorded 18 goals and 21 assists in 54 games to help lead the Vernon Vipers of the British Columbia Hockey League to the Canadian Junior A championship. Gill joins an already impressive freshman class that includes forwards Yasin Cisse, Charlie Coyle and Matt Nieto and defenseman Adam Clendening. The Boston University men’s hockey team left Agganis Arena Saturday night encouraged by a strong showing in a 3-3 tie with the University of New Hampshire. Sophomore defenseman David Warsofsky even said he thought the tie could be a “jumpstart” for the rest of the squad’s season. When the team left The Greek after practice Monday, the mood had sobered significantly, to say the least. With a 7 p.m. showdown at Harvard University on the slate for Tuesday night, BU “half-assed” it’s way through practice, according to BU coach Jack Parker. When the hour and a half session ended, Parker gathered the squad at center ice and voiced his displeasure with a 60-second rant that, among other things, reminded the squad that it was 3-7-1 11 games into it’s national title defense. With a highly anticipated game against No. 7/8 Cornell University at Madison Square Garden coming up on Saturday, Tuesday’s matchup with Harvard (1-4-2) is a potential trap game for the Terriers. Is it safe to say BU’s looking past an unimposing Crimson squad? “Obviously, after this practice,” Parker said. “All I know is the mentality today was awful. Among those who will show up on Tuesday will be sophomore Chris Connolly, who missed both games this weekend against UNH after suffering a shoulder injury in practice last week. Connolly participated fully in practice Monday, and was not wearing one of BU’s light-blue, non-contact jerseys. The winger will likely play on junior Nick Bonino’s top line as sophomore David Warsofsky returns to his customary defensive position after a two-game stint at Bonino’s wing. Additionally, sophomore goaltender Grant Rollheiser has shown on ill effects after making his second start of the season Saturday. Rollheiser, who missed the first eight games of the season with a high-ankle sprain, made his first start on Nov. 14 against Merrimack College. Rollheiser tweaked the ankle injury against the Warriors, and was a gameday decision for Saturday’s contest against UNH. The positive news means Parker can now proceed with the goaltender rotation he had planned on using before the season, splitting time between Rollheiser and classmate Kieran Millan. Millan (2-7-0, 3.2529 goals-against average, .873 save percentage) will be in the crease for BU Tuesday at Harvard, while Rollheiser (1-0-1, 3.3622 GAA, .881 save percentage) will get the call Saturday in New York, according to Parker. Harvard is led by a trio of top scorers, as junior Alex Biega (4 goals, 4 assists), sophomore Alex Killorn (3g, 5a) and freshman Louis Leblanc (3g, 5a) lead the squad with eight points each through seven games. Leblanc, a first-round selection of the Montreal Canadiens in this past summer’s National Hockey League Entry Draft, tallied 59 points (28g, 31a) in 60 regular season games with the Omaha Lancers of the United States Hockey League last year highlighting talents at both end of the ice with a league best plus-33 rating. Disappointed with the production he had received out of his top line, Boston University men’s hockey coach Jack Parker stacked the primary unit with three of his club’s most dynamic players for Saturday night’s affair with the University of New Hampshire. Freshman forward Alex Chiasson and his team-leading four goals were added to Friday night’s pairing of junior center Nick Bonino and sophomore forward-defenseman David Warsofsky on BU’s starting line, a combination that was intended to kick offensive lulls and reinvigorate the attack with each new shift. One night after fatigue and turnovers plagued the Boston University men’s hockey team in a 4-2 loss, the Terriers rebounded to force a 3-3 tie Saturday against the University of New Hampshire at Agganis Arena. Zach made a nice pass across, and I was just trying to spin to protect the puck, and I just took a shot at the net. I think it bounced off a UNH player, so I had a little bit of luck there, but I’ll take it. Me and Corey got to play together a lot last year too, and we’ve always kind of clicked together. Zach’s a big kid, and he works hard, so he’s easy to play with. We got the chance to play back-to-back nights together, which is always nice because you get a little more chemistry when you get used to guys. We’ve been practicing like that for a while, too, so it’s been going well for us. Me and him both have a had a lot of those chances on the power play. We’ve been working on those in practice a lot. We stay after a lot to work on shots like that. That one, he got a lot of wood on that, and luckily it went under the goalie’s arm I think. We just need to keep shooting and hopefully it will keep going in. Yeah, definitely. We spend a lot of time together after practice and messing around and stuff like that, and that definitely helps. Just trying to move my feet more and more. I have a big body, so I just try to move my feet and use my body to protect the puck and hang onto it and make plays down low in the offensive zone. So, I’ve just been working on my foot speed and stuff like that. Basically, it’s just being committed to the team. Before the game, Bavo was talking a lot about how we need to be committed and do the little things to win, and that’s what’s been missing from our games. We haven’t won games, we haven’t pulled them out, and blocking shots is a big thing. So, we really tried to put a lot of effort into that tonight. It was a little different at first, but I’ve played defense my whole life, so once I got back there, it was kind of an easy transition. So, it wasn’t too bad. I thought we were playing well. We had a lot of chances down low. We just couldn’t bury it, kind of how our season’s been going. We haven’t been getting those bounces. I just passed it up to Nick, and then he made a nice play to Alex, and then Alex saw me in the slot, and luckily it went through. We’re trying to stay positive. We’re not getting blown out of games. It’s just those one-goal losses, two-goal losses, where the pucks just aren’t going our way. Everyone knows in the locker room that we have the talent, and we’re just trying to put it all together. A shift’s going to come. Hopefully, this is a jumpstart to the rest of the season. I think we killed penalties pretty well. They have a pretty good power play and shoot the puck a lot. It’s all set up around that umbrella where they just move it across and they fire it. I think holding that team to 1-for-6 on the power play is pretty good. I know they had a lot of shots, but I think we did a great job of blocking shots, too. I’m not exactly sure how many of those shots got through to Grant. He definitely played well. It’s always a lot easier, especially for a defenseman, to be able to count on your goalie back there. We make mistakes, but he’s always there to pick us up. So, it’s nice to have that. I’d like to blame it on the refs, but I try not to. I mean, it’s a penalty, nothing they can do about it now.